Following the success of my first ever attempt at brewing my own beer, I brewed and bottled my second batch in November! I had believed that I had purchased all the equipment that I needed for my home brewing but as with any hobby, you end up buying more gear, which has ultimately added to the end cost of the beer. My kitchen is pretty cold (when there’s no cooking going on) – I think I just about got away with it with my first home brew batch as I was brewing at the tail end of summer but I knew that if I wanted to brew in the winter, I needed to either brew in a warmer room or buy equipment to ensure optimum temperature for the brew. I opted for the latter and bought a brew belt for £24, which is just a plastic heating element that goes round the outside of the fermenting bucket that heats the brew and keeps it at a constant temperature for optimum fermentation. I found that it was very simple to use and worked well. My first kit was a basic Coopers Aussie Lager kit. 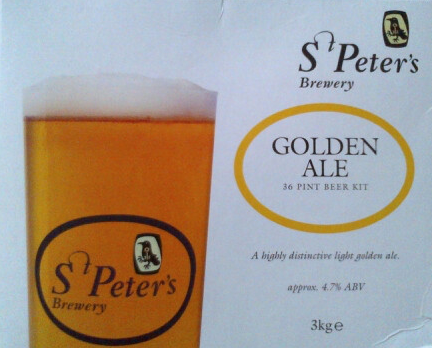 For my second attempt, I’ve gone for a premium kit, St Peter’s Golden Ale which cost £26. The main difference that I saw in the two kits (aside from the price) was that the premium kit contained two tins of malt extract (compared to one tin of extract and a bag of brewing sugar) and also a packet of hop extract. Everything else, including how the ingredients were mixed etc was exactly the same. As before, I didn’t follow the very brief instructions that came with the kit but instead followed the notes that I’d made for my first batch, which I knew worked for me. I was able to get 35 bottles from this brew (just over 17 litres/31 pints), which works out as £1.43 per bottle or £1.61 per pint. A couple of my friends who sampled my first brew said they would pay for future bottles but well, let’s not get ahead of ourselves, this is all just strictly fun (and good drinking I hope!). Whilst this brew is slightly cloudier than my first one, it tastes a lot better, is quite strong (4.5% ABV) with lots of flavour, although I don’t think I primed the bottles with enough sugar as some of the bottles lack a full foamy ale head when the beer is poured out. Still, apparently it continues to mature so future bottles I open may get better. In any case, I will definitely buy this kit again to make. I’m giving away around 10 bottles to friends so I’d best get my next batch on soon! This entry was posted in Home Brewing by weenie. Bookmark the permalink. All kidding aside though: awesome! I'm glad you really enjoy brewing your own beer and that it tastes good too. My dad and I used to make dark Belgian-style abbey beers a long time ago just for fun. Turns out it's not too difficult and rather inexpensive. Don't feel bad about there not being enough foam though. It's really hard to get that right with a DIY set-up. And it's also dependent on the type of glass you use and how clean it is. Next time, maybe try putting it under a cold stream of water just before you pour. Hi NMW, I thought you'd have a chuckle! I've sampled Belgian beers in the past, some strong enough to get me on the verge of falling over after only a couple of bottles! I don't tend to drink beers much over 5%, although who knows what my homebrew will bring in the future! Yes, I really enjoy this new hobby of mine, it's been quite exciting and satisfying drinking my own beer and I've enjoyed my friends' reactions too. Thanks for the tips regarding the foam – I think you could be right about the type of glass – a narrower glass produced a head, better than a wider glass did. It looks good from the picture. It's a fun project, and it saves you a few quid on alcohol so why not enjoy it. I've never brewed before, but it's interesting to follow your progress on it. Please keep us posted with future beers. Looks really good. I have been brewing beer for a few years now from a kit as well. Making some modifications with each batch to see what different flavor profiles I can create. It's fun and I love sharing to see what others think of my brew. Thanks for sharing. Thanks DH. As I'm only a beginner at brewing, I'm not experimenting too much with modifications but it's something that I'm looking forward to doing! Thanks for stopping by. Hi Huw, I'm thinking of trying at least 10 different kits (then going back to my favourites) and there is a range of Belgian kits that are available. However, I'm not sure that I would even want to drink beer so strong but perhaps making a small batch will be interesting! I'm glad you find these beer posts interesting, as they only really have a tenuous link to FI, ie saving me money from not having to buy alcohol! Well done! 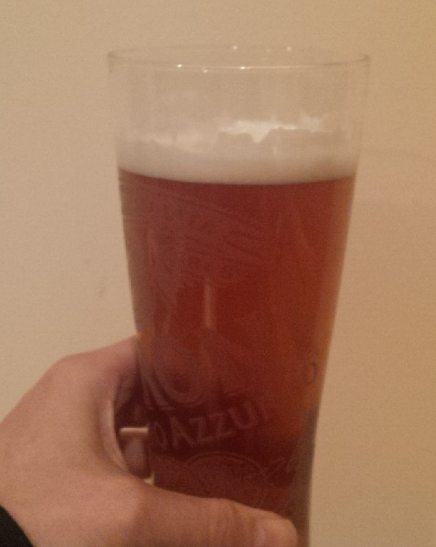 I am now looking forward to tasting one of your home brews at the next meeting with Huw! We do home kits too, although we have not done beer yet. We've done pear cider, elderflower wine (a raging success), sloe gin, and some wine kits. They were all good. I want to get German style wheat beer as a kit, although it always seems to be 'sold out'. By the way, NMW is right, 4.5% ain't strong!!! Hi M, haha! Well hopefully by then, I'll have had some more brews under my belt so will know more about what I'm doing! At some point, I'll be trying a cider kit, although my wine drinking friends all want me to do a wine kit (they should try themselves!). Sloe gin! That sounds interesting as I'm quite partial to a bit of gin! tell you what, let's each bring a home brew bottle of something and swap it when we meet up?! Nice work. How can you test it for strength? I only ask as my friend made some homebrew once and it nearly sent us blind! To calculate the alcohol strength, you need a hydrometer to measure the original gravity (OG) and the final gravity (FG) of the brew. The hydrometer is also an aid to show that fermentation has completed as the gravity will be steady for 3 days. You can use a mathematical formula to calculate the ABV%, ie ((OG-FG) divided by 7.46) + 0.5, or you can just plug in the OG and FG numbers into online calculators. I brewed my 8th batch today…. a chocolate stout. I had to throw away brew 4 as it was sour. I attribute this to cold fermenting temperatures in November last year…. also thinking about getting a brew belt. I also learnt that i hadn't been oxygenating the wort anyway near enough – i seal the fermenter & give it a 45 second shake now before pitching the yeast. makes a massive difference! Hi LCIL, ooh nice! I fancy brewing a stout at some point – did you use a kit as a base and if so, which one? The brew belt has been a great piece of kit and very easy to use – there's no temperature control but I found it simple enough to move the belt up or down the fermenter depending on how much I wanted to heat the wort up. Good idea about oxygenating the wort – I try to pour water from a height to create oxygen bubbles! I should be doing brew #3 this weekend, a bitter! I got the recipe from a Homebrew Book my secret santa got me at xmas. i did a couple of malt extract kits from BrewUK to get started, & have done all-grain since then. it's the lack of temp adjustment that has stopped me getting the brew belt yet. i might get a warming plate/base thing instead, though they are a bit more money. Sounds like a plate could be more suited for you, more expensive than a belt but I'm sure as you keep on brewing, you'll be getting your money's worth!